Colors! Patterns! Timing! Memory! How long of a pattern can you remember? Follow-Me is a game that challenges the player’s memory, motor skills, and reaction time. A color sequence flashes on the screen, the game waits for the player to tap the appropriate buttons in the same sequence. The game uses four colors, sequential random patterns, and increasing speed in an attempt to fool the player into tapping the colored buttons in the wrong order. As the game starts, one of the colors flashes brighter. The game then waits for the player to tap the button that flashed. Then the game flashes the same color once again followed by a second color. 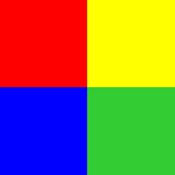 Then it is again the player’s turn to tap the two colors in sequence. Colors are added to the sequence until the number of colors in a level is reached. If the player taps all the colors in the sequence in order, a congratulatory message is displayed with the level the player has reached. The higher the level, the faster the colors flash. Each level has the same number of colors in the sequence. The player is congratulated at the end of each level. This continues until the number of levels in a phase is reached. Once the player has successfully completed the number of levels in a phase, the number of colors in the sequence increases and the timing re-starts. If the player does not respond to a flash sequence, an alert message is displayed after a period of time informing the player that no button was pressed. Acknowledging the alert re-starts the game returning to the first level. The player is also alerted when the wrong sequence is pressed. The final level that the player reached is part of this message. In the settings screen, the player can change the number of colors in a level, the number of levels in a phase, and the number of colors to add at each change in phase. The game “remembers” the last settings selected by the player and re-establishes them when the game is started. Once the player gets more proficient following the patterns, the settings screen allows the player to start at varying levels of difficulty. Finally, the game can be rotated and played in portrait or landscape orientations.